I really wanted to use both sides as a neutral type background, but kept flip-flopping which side to use. I decided to cut it up in strips and make a new piece of patterned paper for my page. I cut the strips according to the width of the tickets and then adhered them to a plain white sheet of cardstock. I trimmed the edges up a little to make sure they were all even. I was able to use both sides of my paper without sacrificing too much of the original design. Do you have some pieces in your stash that you can’t use because you can’t decide which side you love more? I’d love to hear about ways you overcome this predicament. Fantastic use of triangles! Congratulations! Please email me at precociouspaper (at) yahoo (dot) com with your contact information and we will get you set up with your shop credit. The next challenge is coming up, so stay tuned! You’ll notice that I cut the Dear Lizzy paper at the top to create a triangle border that points the viewer down into the layout. In addition, I cut a variety of yellow and cream colored papers from this months amazing Newsflash, Bulletin and Happening Now kits into triangles and used them to create a base for my page. I couldn’t have had much more fun than this! So, have you taken the Triangle challenge yet? Hi, everyone! Dani Donner here today to talk about dimension. I have to say I have been putting my 3D dots to use much more lately, so my LOs rea getting more dimensional (and bulkier, lol). There is something about bringing something closer (or farther) that is really appealing to me right now, a different way to “highlight” an element, I would say. So, why don’t you try your hand on a more dimensional page? I can tell you it is lots of fun! The first thing I like to do is print it out, then cut or punch all the elements out so I can see what I’m working with. As you can see here, I’ve layered some of the pieces and added some stitching. I also LOVE to add pop dots to create more dimension. Totally love the arrows in the printable this month, that is one trend I am on board with! Here’s a peek at a few of the free cut files I’ll be offering today. Totally love that smile frame, and as you can see here, it’s not just for a picture! 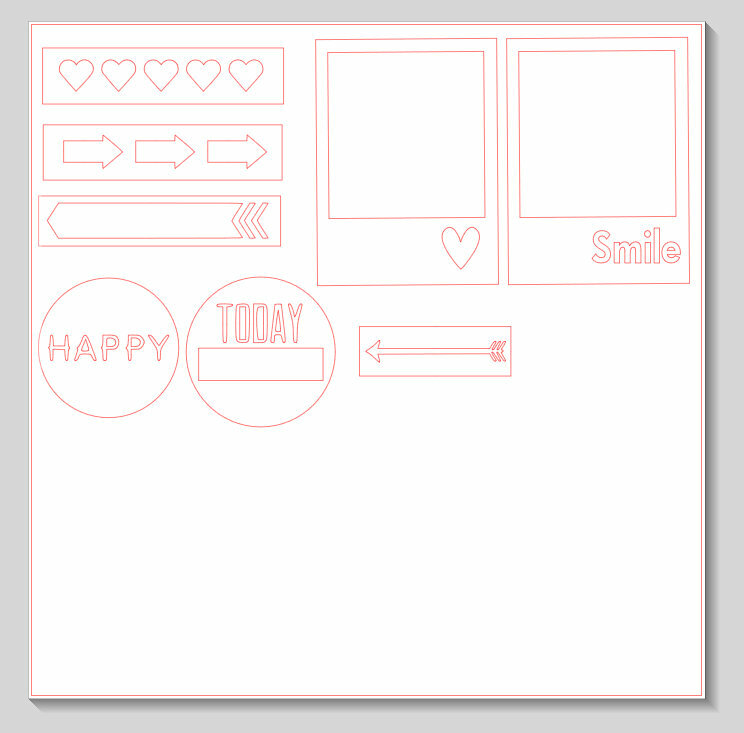 I’ve created some cut files based on the printable that you can download free! Click HERE to be taken to the download page for this cut file. Hope you have fun with it! We’d love it if you’d share your projects on the Scrapbook Circle Facebook page. Today we are sharing design team member Rebecca’s lift of subscriber Debbie’s layout. She shared this amazing page with us on the Scrapbook Circle Facebook page. I was instantly drawn to the chevron with the woodgrain, and of course that large heart like that is so eye catching! So many little touches here and there that just make this page inspiring. Here is the layout that Rebecca made to lift Debbie. Rebecca started with a Kraft base just like Debbie and also matted patterned paper on cardstock like she did. Rebecca used a large element in the upper right hand side and the same little cluster in the vertical corners with Washi tape and some die cuts. She also used stitching throughout some of the elements and chose square photos. Great layouts from both ladies today! We hope we’ve inspired you to create something. If you would like to be considered for the Lifting You feature, share your work using Scrapbook Circle kits on the Scrapbook Circle Facebook page. Let’s meet the October Guest Designer — Amy Coose! My name is Amy Coose and I live outside of Washington DC in Northern Virginia with my hubby of 16 years. We have three beautiful kiddos. My oldest, Austin, is 13, my middle child is my gorgeous girl Georgia, and then there’s my baby Davis, who just turned one. Yes, there are 10 years in between my middle child and my baby. He was our bonus, and such a blessing! I’ve been scrapbooking since my oldest was born, and love being able to record special moments in our lives that I am sure I would totally forget if I didn’t have the scrapbook pages to look back on. When I am not scrapbooking, I am at the hockey rink. We are a hockey family and spend a lot of time traveling around to watch my son who plays travel hockey. What do you like best about the October kit? It would have to be patterned papers. Lisa must have totally had me in mind when she picked out this month’s kit, because they are some of my favorite papers ever! Where do you do your crafting? We have a huge finished basement, and my scrapbooking nook is down there. It’s where the kids hang out, so I can scrap while I hang out with them, which is nice. What do you like to do best when you aren’t scrapbooking? I do like to run, but only manage to get out for a few short ones during the week since I’ve had Davis. I guess I’ll admit that I enjoy trashy TV shows every now and then. Davis and I are all caught up on The Real Housewives series. Thanks so much to Lisa, and the fabulous DT at Scrapbook Circle. It’s been so much fun creating with the amazing October kit, and I can’t wait to share all the stuff I’ve created. Thank you, Amy! We love what you made this month with the kit! I decided to go big with my title — and used my Silhouette to stretch it across the page. 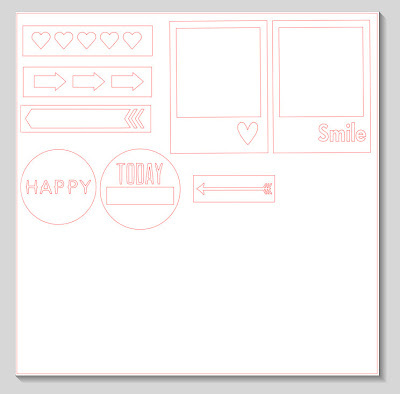 Totally loving these Studio Calico wood veneer speech bubbles this month too. We can’t wait to see what you create with this kit! Share it with us on the Scrapbook Circle Facebook page. Ursula likes the look of varying sized triangles. She hand cuts her triangles, and if one seems too big, she simply trims one side. On this page, she layered and strung them together to create a fun arrow-like banner. I love the dimensional effect! If you’d like to try your hand at triangles, we’d love to have you join in on the fun! You can find the challenge details here. Entries are due in a little less than a week. Happy scrapping!